Elizabeth Heath, a 2006 member of Bluecoats, sent this picture. 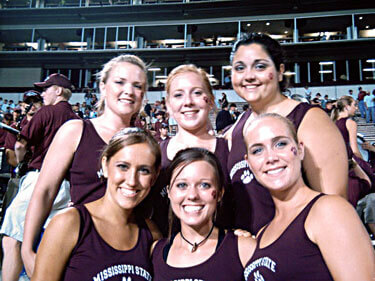 Here is a picture of six members of the Famous Maroon Band color guard at Mississippi State University after one of our home games. Each of us has been a member of a Division I color guard in DCI, and four of the six girls have performed in the World Championship Finals. We have a great time performing together at State and sharing our individual drum corps experiences with each other. Between the six of us, we have a lot of interesting stories to tell. (Left to right) Top row: Amye Henry (Blue Knights 2006), Elizabeth Heath (Bluecoats 2005), Anna Rowley (Southwind 2003-2004). Bottom row: Jana Pate (Bluecoats 2006), Jennifer Cooper (Colts 2006), Megan Miles (Phantom Regiment 2006).